We made this for a potluck yesterday, and it turned out great. It can be served warm, chilled, or at room temperature. In a small frying pan, toast the sesame seeds over medium heat, shaking the pan frequently, until lightly colored, 3 to 4 minutes. Immediately pour onto a plate to cool. Set aside for garnish. Bring a large pot filled with water to a boil over high heat. Add the noodles and cook according to package directions. Drain, rinse with cold water, and drain again. Place the noodles in a large bowl, add the 1 teaspoon sesame oil, and stir to coat. To make the sauce, combine all the ingredients in a small bowl and mix well. Place a stir-fry pan over high heat until hot. Add the vegetable oil, swirling to coat the sides. Add the onion and cook, stirring, until it begins to wilt and is fragrant, about 1 minute. 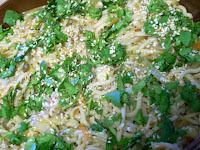 Add the cabbage, bean sprouts, and carrot and stir-fry until the cabbage is tender-crisp, about 2 1/2 minutes. Add the sauce and noodles and toss until all the ingredients are evenly distributed. Garnish with the sesame seeds and cilantro.